In the case of many families, where members are ill, retired or out of work, there are provisions wherein the government pays a particular amount which the benefactors can use to meet their daily expenses and do not ever fall into the bracket of relative poverty. As is the case with most governmental services, in order for a qualified benefactor to receive a Deposit Forms he or she needs to fill and file a social security deposit form. 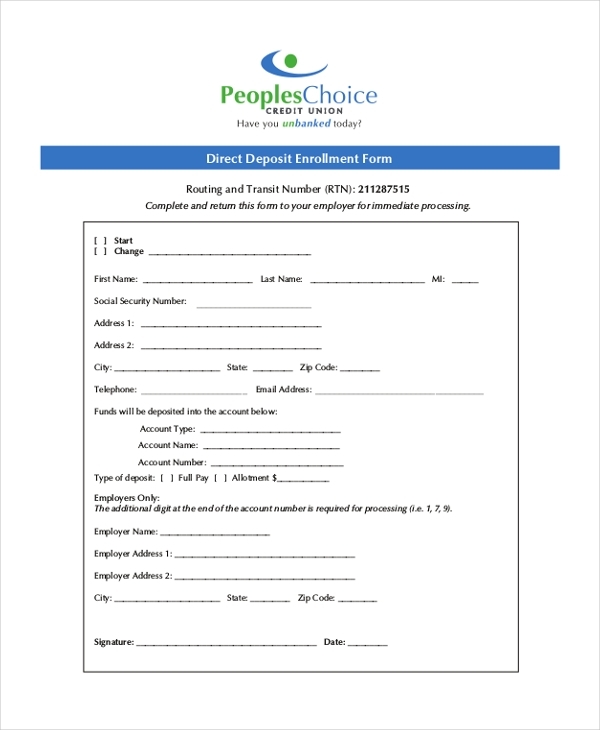 If an eligible benefactor would like to receive the social security payment via direct transfer, the person needs to populate a designated sample social security direct deposit form wherein an applicant needs to provide relevant bank account details and also give his signature authorizing the payment to be made to the designated bank account. If a social security deposit benefactor would like the government/employer to transfer the social security payment directly into a particular bank account, he or she needs to populate his personal details and bank account information in a social security direct deposit form. Upon successful verification, the applicant will be notified of the same and the payment process will be initiated in accordance with rules and regulations of the payment cycle. In case a person is suffering from a disability and is unable to work, he or she can also apply to receive social security funds from the government. 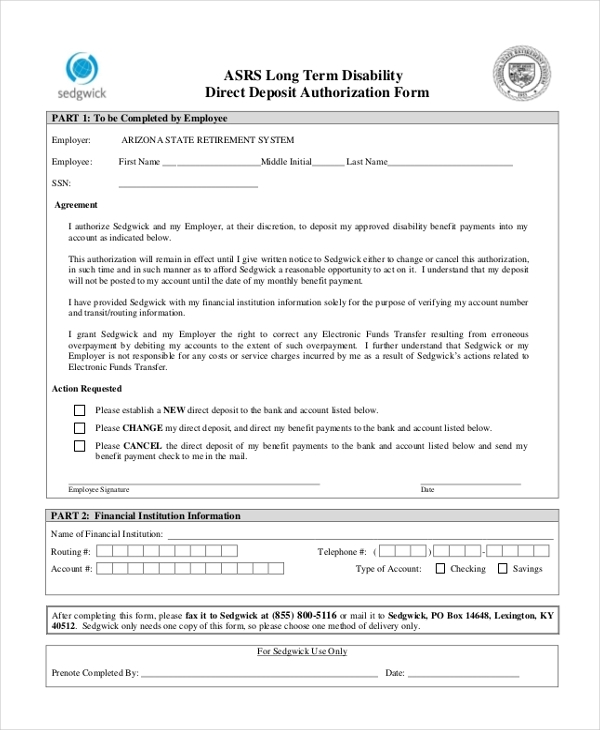 For the said funds to be wired directly into a bank account, a disabled person needs to establish their details in a social security disability direct deposit form. Just like any other form of such type, a benefactor needs to provide relevant bank account information along with whatever personal and medical information requested. 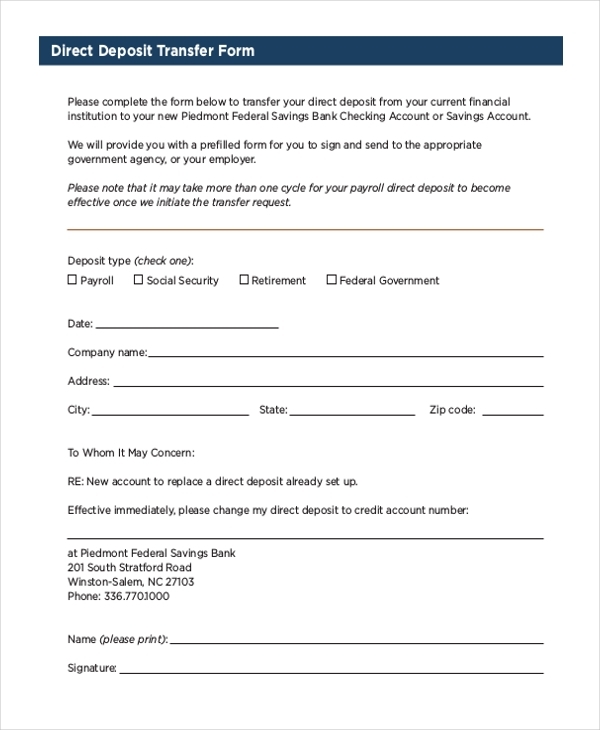 A social security direct deposit transfer form is utilized in scenarios when a benefactor would like to transfer their direct deposit funds to a new bank account. The deposit type must be indicated, and the required personal information and bank details must be accurately specified in the form. In the event of a social security payment benefactor getting a new bank account and wants to inform his or her social security depositor about the same, then they need to make use of social security direct deposit notice form. The fields need to be populated with correct information and after the form-filling and submission process is through, the benefactor must inform the depositor about the same. There are many ways to facilitate easy transfer of social security funds. One of the methods is to be fill up a social security direct deposit authorization form in which a benefactor needs to furnish bank account details as well as depositor information. If a person is eligible for social security payments and has decided to enroll in the scheme, he or she needs to fill up a designated social security direct deposit enrollment form. 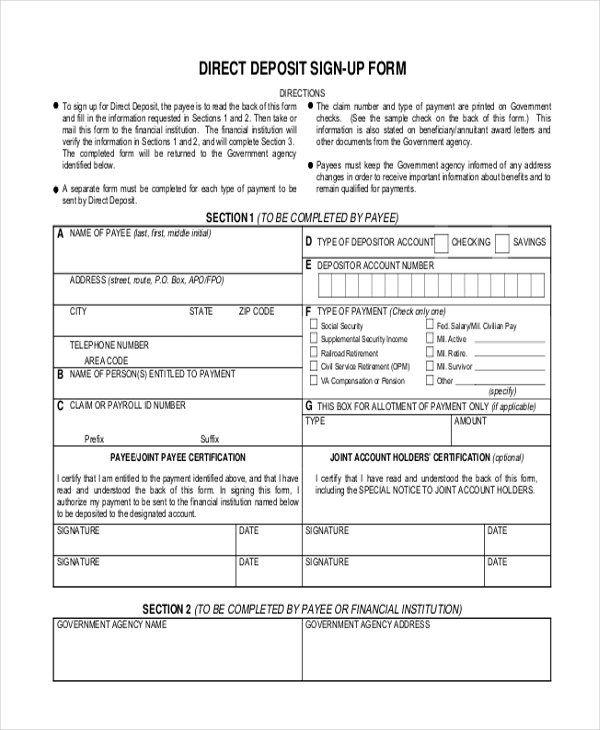 Also, this form is handy and can be used as means to notify an existing depositor that benefactor has become associated with a new institution. 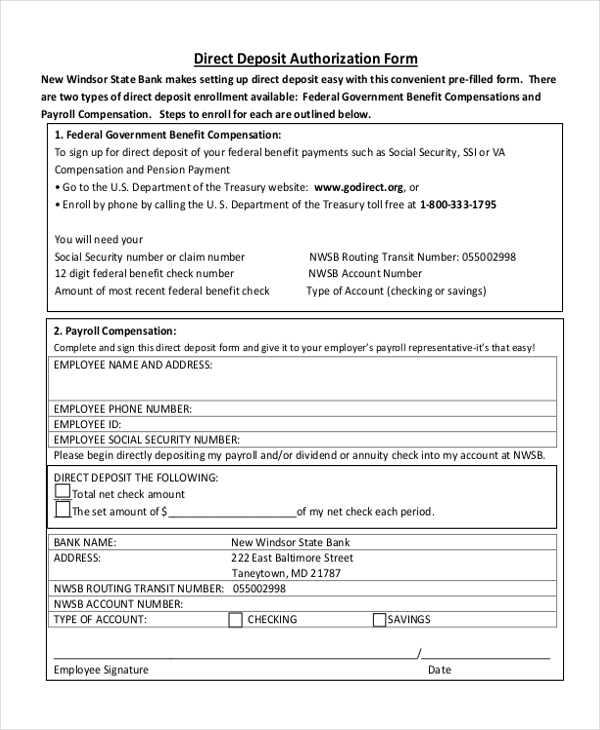 A social security deposit form is used in scenarios when an applicant wants to apply and receive the benefits of social security from his employer or the government. It must be noted that a form of such can only be used if an applicant is disabled, ill and unable to work, or is retired from work life. 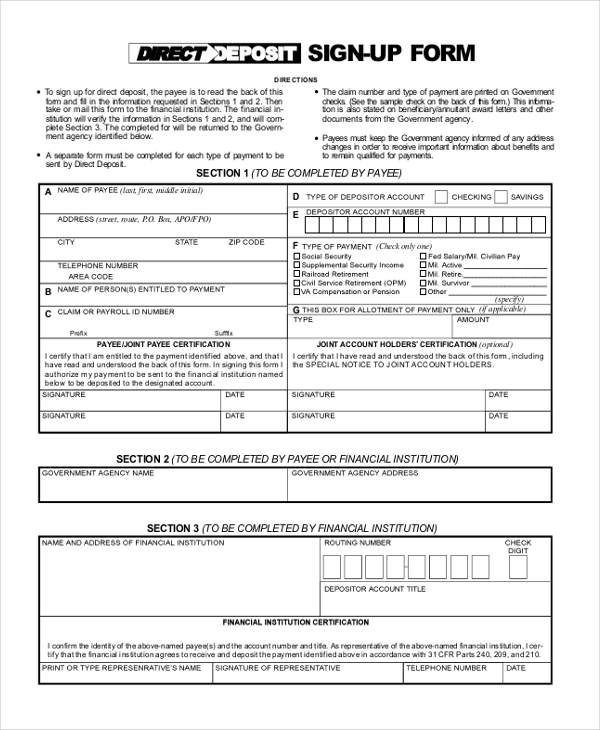 The social security direct deposit form needs to be supported with appropriate documents showing the status of the applicant and proving their eligibility for the social security deposit arrangement. You may also see Security Deposit Receipt Forms. Where to Find a Social Security Direct Deposit Form? Social security direct deposit forms are easily gettable on the Internet. In case a user or applicant would like to see a sample, there are many websites which offer this facility. The USP of the sample forms is that they are downloadable, editable and printable. In all likelihood, the forms are available in either of the formats MS Word, Excel or PDF. Social Security Direct Deposit Forms are an important necessity and their availability is a big plus for applicants and existing benefactors who wish to fulfill different purposes with regard to the social security deposit scheme. Be it a new enrollment or notification of a change in bank details. Social Security Direct Deposit Forms make the procedure become very easy and convenient. 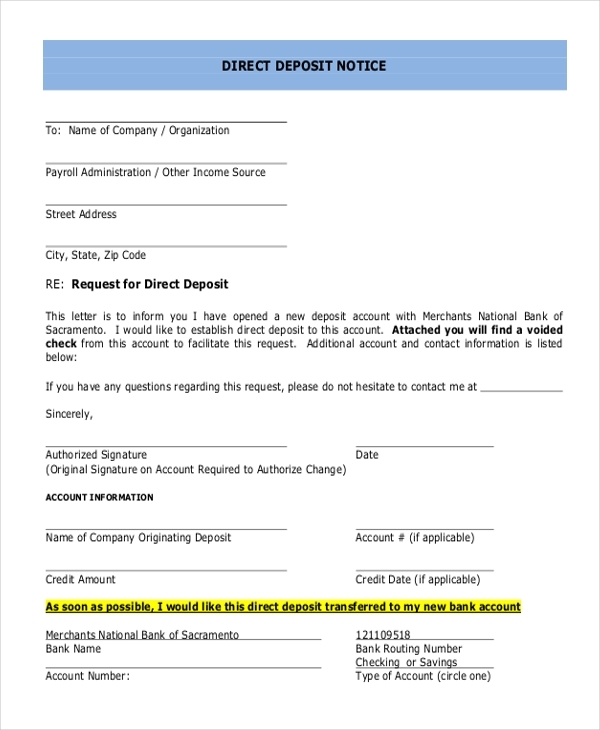 You can also see Payroll Direct Deposit Forms.